As with the previous tours, John Arrowsmith (Rush pyro guru and tour photographer) is posting great, high-quality photos of the Rush shows. I'll be highlighting one (and sometimes more) photos from each night. Thanks to Rush and John Arrowsmith for making these available to the fans. See all the photos here. These photos will typically contain spoilers, so I recommend that you don't click any of the "Photo of the night" blog entries if you like surprises. I'll be dropping "SPOILERS" from the title after this entry. So, here's my first pick from the 2012 Clockwork Angels tour. Click the photo below to go to a larger version on the official site (which is also available to buy). 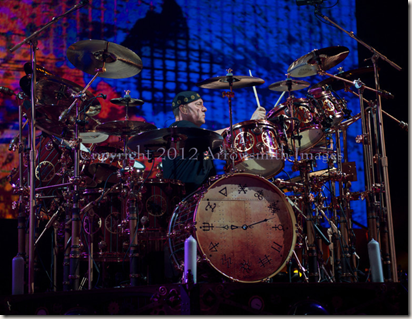 Neil is continuing to use the Time Machine DW kit on this tour. Not sure if there are any other changes at this point. Until we see a shot from the top, I'm not sure if the cymbals include the "Clockwork" design as they did during the Time Machine tour. The front bass drum head has been changed to a Clockwork Angels theme.